It had been a few months since his break-up. It was still tough. The pain never ceased to exist. He was still healing but then one day he saw a girl, a colleague. She was this cool person. She had heard about her but never seen her. She had heard about her interest in rock music, her tattoos, her care-free attitude. She worked to pay bills and go on adventures. She was an unstoppable fierce woman. He was quite like that. But, for him, people came first. He invested in friends the way she invested in herself. That day they talked. There was a spark in their eyes. They became really good friends in a really short period of time. His friends used to badger him to ask her out. Her friends used to do the same. There was love and chemistry between them. But, the problem was that they were scared out of their minds. After their numerous conversations, he started thinking of himself first. And she became a little less robotic and more caring. He taught her empathy whereas she taught him solitude. They knew they were vulnerable in front of each other. No one before had controlled their lives in such a way. Everyone knew that they were in love but they were afraid. He was scared of being left alone. She was scared of being left friendless. Even if it was obvious, they were in denial. It was that moment where they didn't want to lose each other even when they weren't even together. 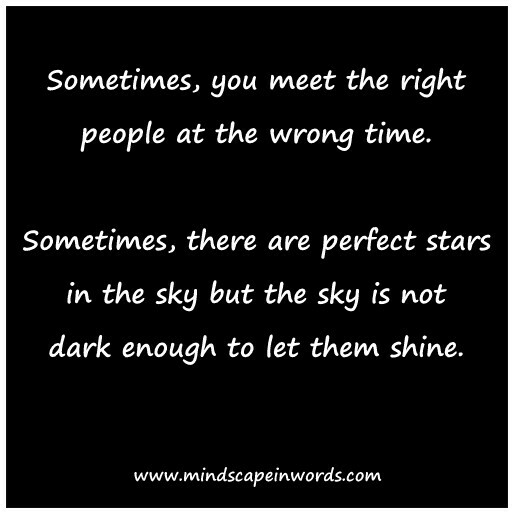 Sometimes, you meet the right people at the wrong time. 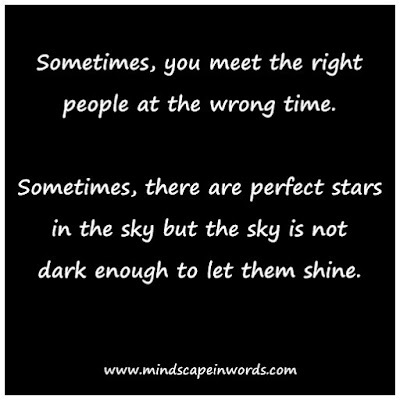 Sometimes, there are perfect stars in the sky but the sky is not dark enough to let them shine. Sometimes, there are only happy nows and no happy endings. I like the idea behind Monday Moments, are they based on real stories? I love this entire piece... especially that last line. We have all felt like this. After a break up. Good one.. But... If it's just not meant to be... Probably the best way to find what's really meant to be.. This is another beautiful read. There are so many deep truths to your stories. Sometimes things happen in life when the timing is not right. 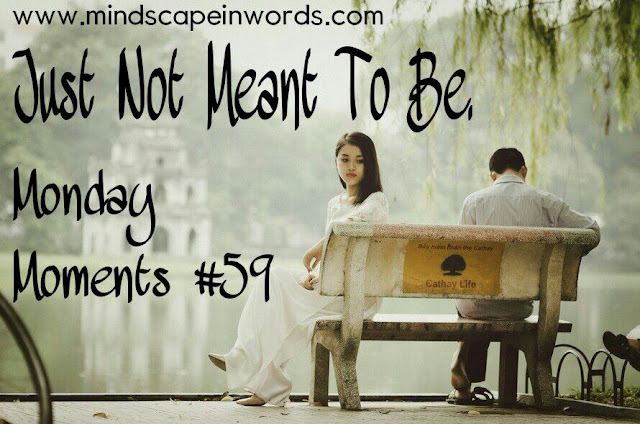 Or sometimes things are just not meant to be. i love this and I love your quote! So good. Beautifully written.Most problems start when you are afraid.Relationships are always difficult,but we always regret things we don't do more than those that we actually do.Keep spinning magic! Nice one! I love the sentence in the end: "Sometimes, there are only happy nows and no happy endings." You have a really cool writing style.